Select Size 12" WHITE 12" PINK 24" 54"
Sold in Pairs! 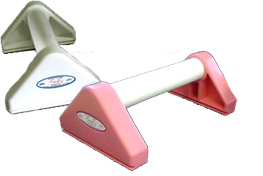 A perfect tool for gymnasts for overall strength training and for athletes of all levels! Small and lightweight for easy use, transportation and storage. Our Paralletts are designed to simulate full size equipment, giving you an edge during gym meets and other competitions. StanRay Parallette workout bars are made of lightweight PVC and polypropylene. Perfect for L-seats, planches, handstands, iron cross strength training, pushups, dips, and stretching. Three sizes to choose from. CAUTION: Any activity involving motion or height creates the possibility of catastrophic injury, paralysis or even death. This equipment is intended for use ONLY by properly trained and qualified participants under supervised conditions. Use without proper supervision, or abuse, could be DANGEROUS and should NOT be undertaken or permitted. Before using, KNOW YOUR OWN LIMITATIONS and the limitations of this equipment. If in doubt always consult your instructor. Always inspect for loose fittings or damage and test stability before each use. Be sure proper matting is in place. Recommended for indoor use. Use on a flat surface. User assumes all risks. User assumes all risks.